Posted February 2nd, 2013 by Jan Meissner & filed under Uncategorized. 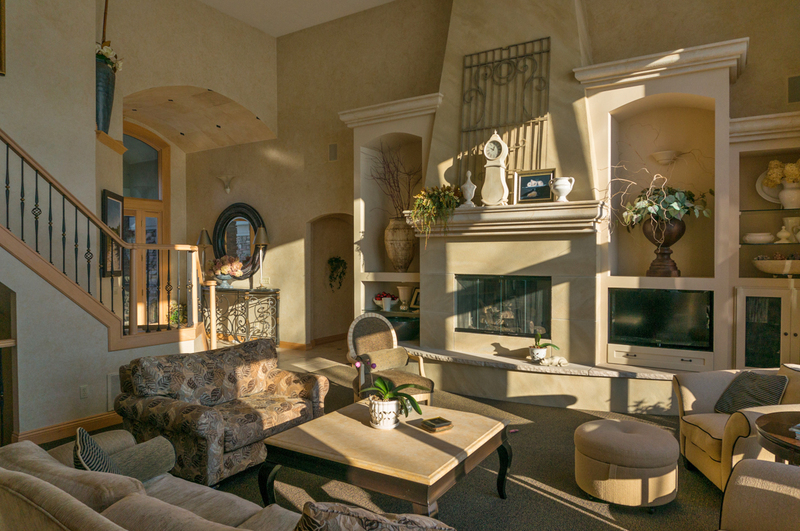 Unfortunately, using real stone for this fireplace would cause it to collapse through the floor into the basement. Apparently 15 foot slabs of limestone and a 12 foot chimney tip the scales close to a ton. 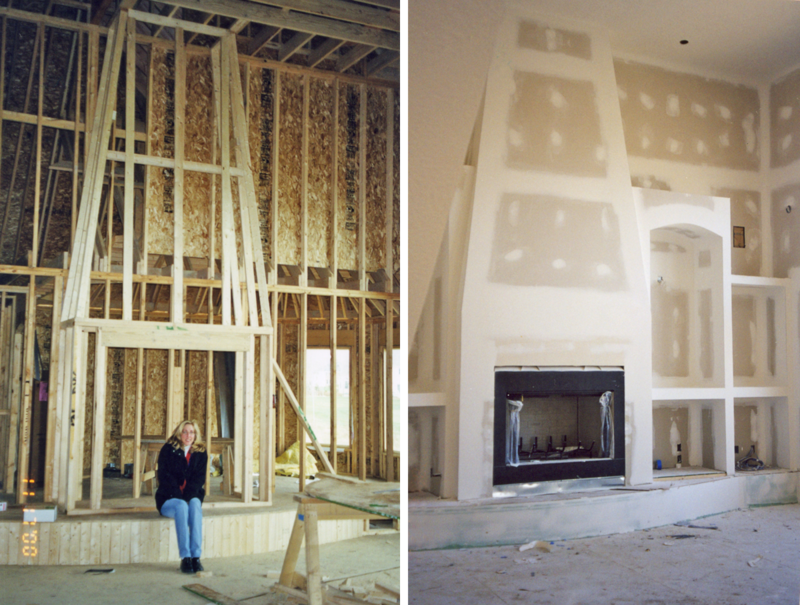 So when we built our home 12 years ago, I designed this feature wall using light weight materials. 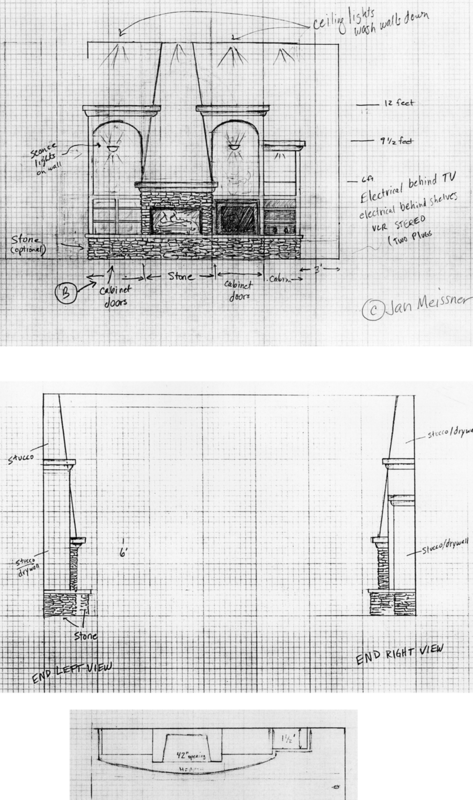 If we built a second fireplace beneath it in the basement, the weight of real stone could have been supported, but the cost of two fireplaces would collapse the budget. And since that particular calamity was well underway, I decided to punt. Which means paint, my go-to play when I have a decorating dilemma. 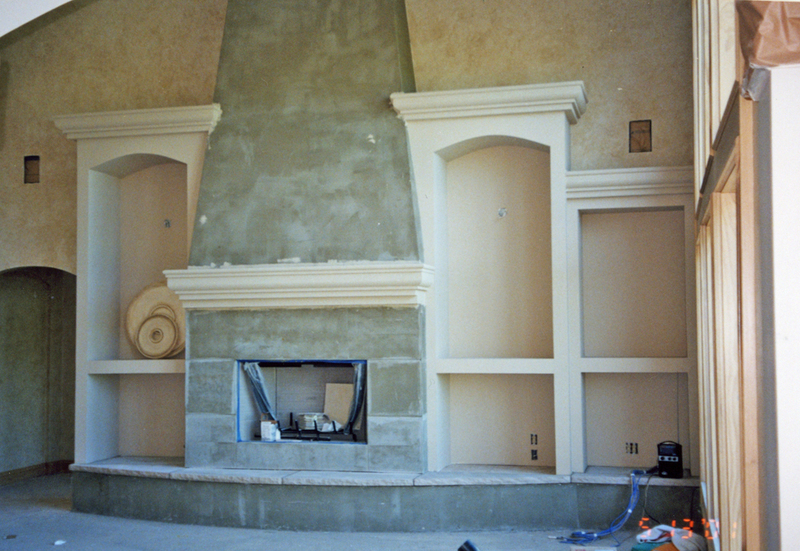 So the only real limestone on our fireplace is on the hearth – the rest is painted stucco. And while I went for a stone look, I think the whole structure could be antique white and look lovely. The frame is 2 X 4 construction. 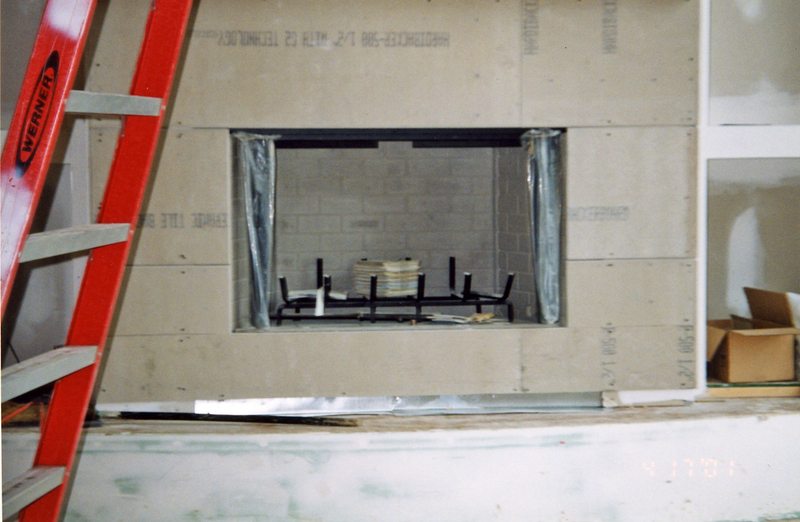 Cement board surrounds the box and is non flammable to comply to code. I had them leave spaces between the boards so I could grout between them for the illusion of separate stones. The upper portion is drywall. After dry wall, the surface texture was created with fake stucco (EIFS) troweled directly onto the drywall. No metal stucco screening was used. Just a skim coat of whatever cement they use, then the textured layer. Then I painted it. The original sketch was skewered on a nail to the wall and later disappeared into one of those debris piles of wood chips, caulk tubes and Burger King bags. But I found a copy of one of the concepts. This version depicts individual stones which I ultimately chose not to do, but you get the idea. I had sketched a few variations. While it’s not exactly an architectural CAD drawing it is to scale and it’s as good as it gets from an artist with graph paper and colored pencils. The construction guy did an awesome job. The mantle is made of Fypon (urethane foam). 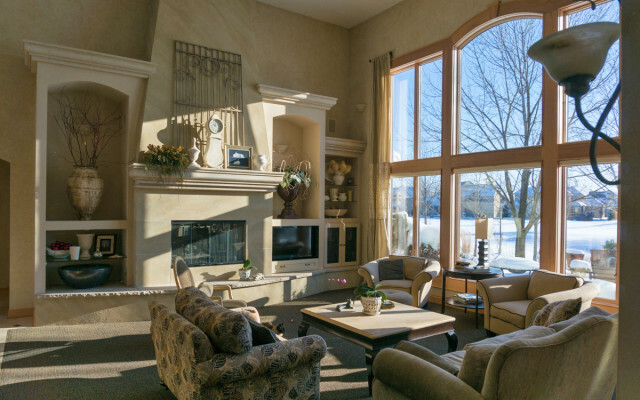 Fypon is merely decorative moulding and is not load bearing. To support weight, an enormous wood beam is anchored to the structure behind it. The decorative garden gate on top of the mantle (I ran out of space in my garden) is made of steel and weighs about a hundred pounds. My husband and I lifted it above our heads while standing on ladders, which is about as safe as holding onto a car bumper while roller blading. That gate’s not going anywhere for a while. The top of the mantle is 7 feet from the floor. 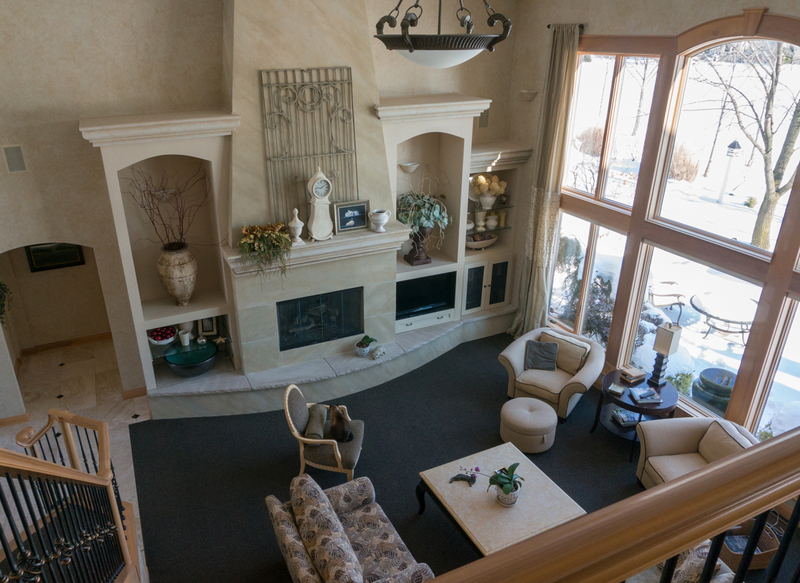 The fireplace meets the ceiling at 19 feet. So all of my painting was done standing on my builder’s scaffold. We had a deal. He let me use his scaffold if I promised not fall off and sue him. So pretty…and so much cheaper to do than stone! I love it!